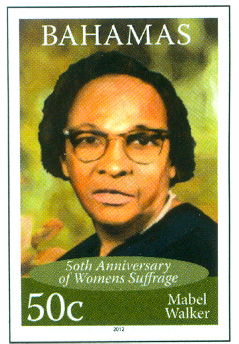 Nassau, Bahamas - The Post Office Department will issue a new commemorative postage stamp in commemoration of the 50th anniversary of the Women’s Suffrage Movement on Wednesday, October 10. 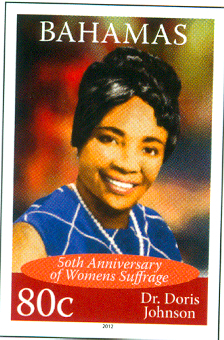 This issue will include a 15c stamp bearing the image of Mary Ingraham; a 25c stamp bearing the image of Georgianna Symonette; a 50c stamp bearing the image of Mabel Walker; a 65c stamp bearing the image of Eugenia Lockhart; a 70c, bearing the image of Dame Alberta Isaacs and a 80c stamp bearing the image of Dame Doris Johnson. In the general election of 1949, Mary Ingraham’s husband Rufus was displaced. On his return from campaigning, he contributed his losing the election to the fact that women were not yet able to vote. He felt that most males who were eligible to vote were interested in only material things (primarily alcohol and cash), if one wanted to secure their vote. Thus the idea of the suffrage movement came into being. She later became founder and president of the movement. 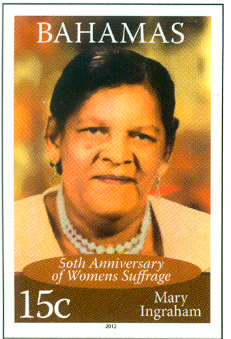 Recognising the iniquities in voting rights, Mrs. Georgianna Symonette along with Mrs. Mary Ingraham, Mrs. Mabel Walker and Mrs. Eugenia Lockhart and other women started the Women’s Suffrage Movement. 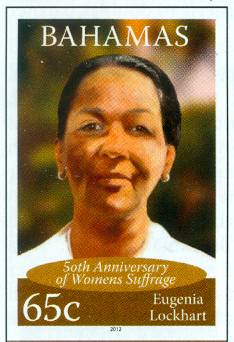 In order to sensitise the government of the day that women wanted to vote Ms. Symonette and the other suffragettes toured the entire archipelago and obtained 3,000 signatures. 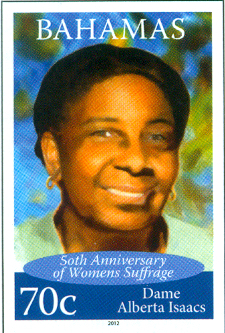 Mrs. Mabel Walker was an activist for the Suffrage Movement in The Bahamas demonstrating with small bands of women for the rights of women. She attended many Women Alliances conferences in England, Ireland, Africa and Italy. Eugenia Lockhart met with the small group of women to seek the vote for women, she found herself at the forefront of the Women’s Suffrage Movement. She did not seek self-aggrandisement or accolades. Dissatisfied with the status quo of Women in The Bahamas Dame Albertha Isaacs and many of her contemporaries joined a movement that became a force to be reckoned with globally within the western world. Dame Doris Johnson joined the Women’s Suffrage Movement after returning home from her studies at the University of Toronto. 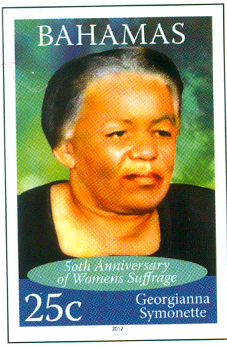 She led a march to the House of Assembly during which time the women demanded they be given the right to vote. Their petition was given in the Magistrate’s Court since UBP Members of Parliament refused to be addressed by the women in the House of Assembly.